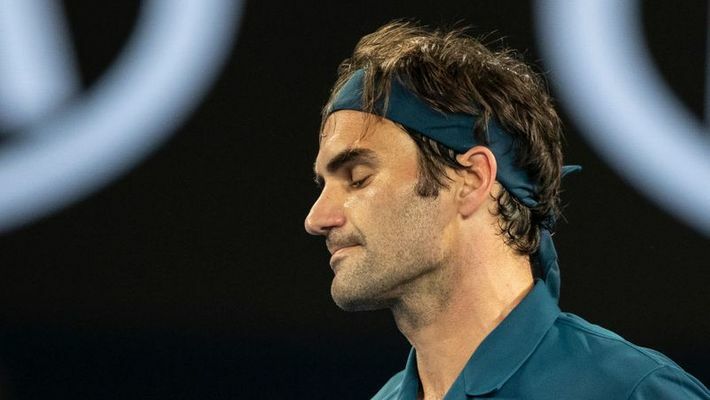 Defending champion Roger Federer was stunned by fiery Greek Stefanos Tsitsipas who ended his bid for a record seventh Australian Open on Sunday on a day of upsets that also saw second seed Angelique Kerber crash out. The Swiss master caved in under the energy and pressure of a man 17 years his junior to tumble out 6-7 (11/13), 7-6 (7/3), 7-5, 7-6 (7/5) in the last 16 on Rod Laver Arena. World number two Kerber was also sensationally bundled out by a woman playing the event for the first time, with American Danielle Collins humiliating the Wimbledon champion 6-0, 6-2 in under an hour. The man Federer beat in last year's final, sixth seed Marin Cilic, was also sent packing by Spain's Roberto Bautista Agut, who now plays Tsitsipas in the quarter-finals. Five-time Grand Slam winner Maria Sharapova was another to fall, but there was no such drama for a rampant Rafael Nadal who powered into the last eight with a straight sets win over Tomas Berdych. Federer was gunning for a 21st Grand Slam title but had a battle on his hands from off against the 20-year-old, touted among the new generation of young stars as a future champion. "I'm the happiest man on Earth right now, I cannot describe it," said the 14th seed, who is the first Greek in history to reach the quarter-finals of a Slam. "I've been idolising him (Federer) since the age of six. It was a dream come true for me just being on Rod Laver facing him. Winning at the end, I can't describe it." The Swiss great was gracious in defeat, saying "I lost to a better player who was playing very well, who hung in there and stayed calm". Wimbledon winner and 2016 champion Kerber, the bookies' favourite along with Serena Williams after defending champion Caroline Wozniacki was ousted early, was no match for Collins, ranked 35 in the world. Collins is little known after playing much of her tennis in the US college system and was making her debut in the main draw at Melbourne Park. She had never won a Grand Slam match before this year. Men's second seed Nadal, returning from foot surgery, barrelled past former world number four Tomas Berdych 6-0, 6-1, 7-6 (7/4) as he stays on track for an 18th Grand Slam title. "I always say the same when I am back for injury," said the Spaniard. "I don't expect negative or positive things. I just try to do my work every day and just be with (the) right attitude every single day." He will play world number 39 Frances Tiafoe for a place in the semi-finals after the young American celebrated his 21st birthday by grinding his way past Grigor Dimitrov 7-5, 7-6 (8/6), 6-7 (1/7), 7-5. Hometown hero Ashleigh Barty also made the last eight after muscling past Sharapova and will next meet Petra Kvitova. Sharapova claimed her biggest scalp since completing a drugs ban in 2017 when she rolled Wozniacki in round three and looked on track to carry the momentum forward. The 30th seed won the first set but then fell to pieces, eventually succumbing 4-6, 6-1, 6-4. "I knew I had to keep chipping away - in a sense, trust the work we've done. I know that I can match it with the best," said Barty, seeded 15. Next up for the diminutive 22-year-old is Kvitova, who beat Barty in the final of the warm-up Sydney International this month. The two-time Wimbledon champion beat 17-year-old Amanda Anisimova 6-2, 6-1 to match her best performance at a major since being slashed in a terrifying attack at her home in late 2016 that left her with lasting nerve damage in her fingers.